Pentecost in French Canada | Walk with us! It is Sunday morning and we have just concluded celebrating the feast of Pentecost, the Church’s birthday. I am at our SCJ community house on Boulevard Gouin having arrived here late Friday afternoon. The community currently consists of eight SCJs but only seven are in the house at the moment. Fr. Zenon Zendkici, scj, from the Congo is here on a sabbatical year but at the moment is in Ottawa. I’m sorry I missed him as Zenon was studying in Rome while I was a member of the general administration. One of the perks of living in Rome is that over time you come to know many SCJs from around the congregation who pass through the house or live there for a time. It really gives you a sense of the internationally of the SCJs who are now working in 38 countries around the globe. We added, or are in the process of adding, number 38 this year when a cooperative effort of several of our Latin American Provinces will begin a new mission in Paraguay. Most of our Latin American Provinces are small outside of Brazil where the SCJs, especially in the south, have flourished. Support in the way of personnel from Brazil will be very helpful to this new project. The province of Argentina and the district of Uruguay are also participating in the Paraguay project. Even here at Boulevard Gouin one immediately senses the internationality of our congregation. Walter van Aas is an 86 year old Dutchmen who came to French Canada a long time ago and worked for many years in parishes about an hour outside of Montréal. Fr. Rein van Leeuwen, scj, as I reported in my last bog, is also from Holland and spent most of his life working in Indonesia. We were reminiscing last evening that he was my guide on my first trip to Indonesia in 1990. Br. Dieudonné Tchouteu, scj, came to French Canada about ten years ago from our province in the Cameroon. Finally Fr. Claude Bédard, scj, a French Canadian, spent many years working in the Congo. In addition to Claude, Br. Luc Coursol, scj, Fr. Roger Phaneuf, scj, and Fr. Maurice Légaré, scj, are also French Canadians. 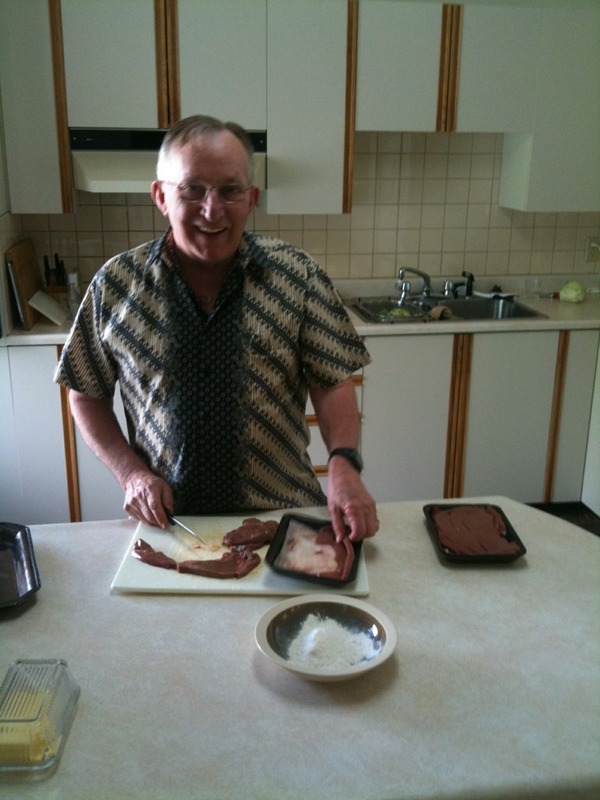 Maurice is an excellent cook and serves as the weekend chef for the community. His back-up is Claude who is in the process of preparing the noon dinner as I write this. Maurice is helping out in a special blessing ceremony at a nearby parish so today’s meal is in Claude’s hands. Even simple things like meal customs and foods are a reminder of how international we SCJs really are. Here in French Canada, for example, soup is a part of every noon and evening meal. Wine, when it is served, tends to lean very much toward French varieties where as back home we might be a bit more eclectic in our choices. Finally, the language of the house is French though with me around English is freely spoken as well since my French is very limited, to say the least. Later this afternoon I will head to the Providence International Centre to prepare for our Interamerican Committee Meeting. It will kick off this evening with an informal gathering at 7:30 PM. This year’s theme: Crisis in Haiti: How is it a sign of the times for us? How do we respond? Its stated objective: To share ideas on how today’s religious can be present with the poor following the crises in Haiti and Chile. The SCJs do not have anyone serving in Haiti, however we do have a small province in Chilie and even though by and large they escaped the havoc caused by the earthquake it will be interesting to learn from our Latin American representatives from CLAR how the earthquake has impacted religious in Chile.